The various types of detached thatched villas on Waterpark Belterwiede are all on the water. You can moor your boat near the villa. You have the choice of four different variants: a 4-pers. type (NL-7946-06), a 6-pers. 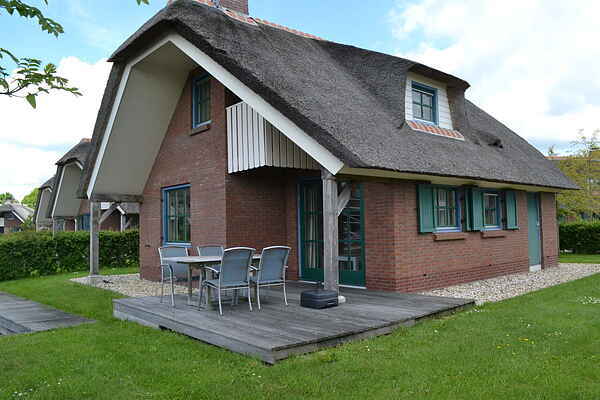 type with bedroom and bathroom on the ground floor and one toilet (NL-7946-07), the same 6-pers. type, but with 2 toilets (NL-7946-08) and a 6-pers. 115 m2 large villa with a clear view over the Belterwiede (NL-7946-09). All villas are comfortably and luxuriously furnished and have a spacious garden with terrace and garden furniture. You can park two cars at the villa.